The Thames Coromandel District Council has published a beautifully presented magazine that highlights news about the council, district, along with special articles. Our Heritage is Gold, page 86. 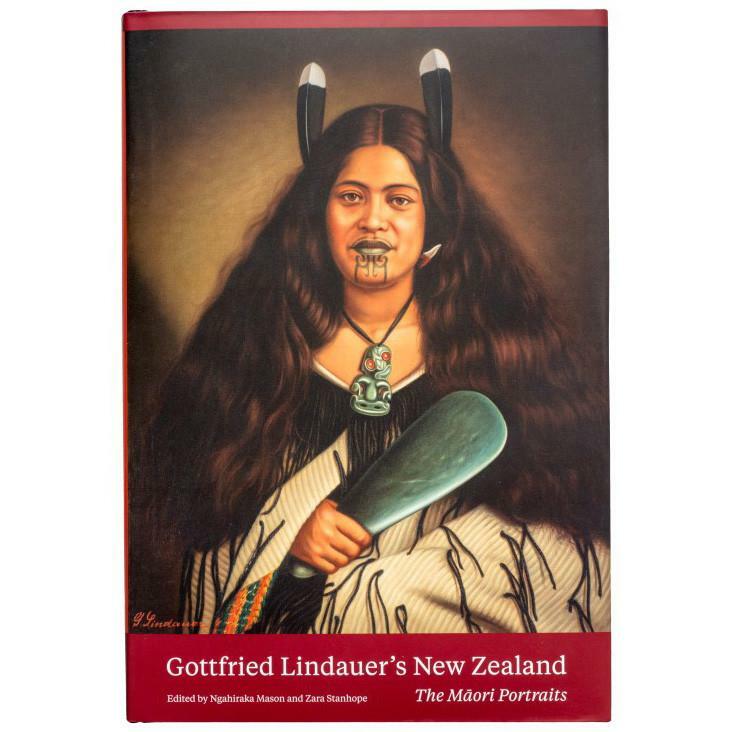 There is an overview of how the goldfields were opened and the input of local Maori Chiefs. Details of the commemorations held 1 August 2017 are covered, plus the history of Judd's Foundry which started as the Thames Ironworks. Catch Gold Fever, page 87. This page covers the main tourist attractions in the town, plus a map that showcases the five historic walks available around the town of Thames (from Tararu to Parawai). This is available in hardcopy at the council offices or can be viewed online and or downloaded. Praying for Gold, pages 88-89. Oddly starts with a photograph of nearby Karangahake! The theme here focuses on the church and influence on the Thames Goldfield. With news that on 25 February 2018 there is to be an outdoor church service for the town entitled "Picnic & Praise in the Park." My Heritage, pages 90-91. These pages feature the special books that have been written for the 150th commemorations of the goldfield town of Thames. Books by authors: Allan Berry, Kae Lewis, Angela Curtis, Sharleen Campbell & Jennifer Comer, and The Treasury (Thames). Where the Maori Found Gold, page 93. This page explores the three songs that were written for the original song contest by composers/singers: Estelle Cashmore, Sean Kelly and Andy McCaskill. 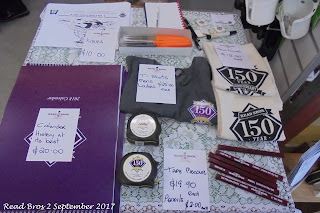 Come Celebrate 150 Years, Thames Jockey Club (Inc), page 96. Explores the history of horse racing at Thames, along with news of the 150 race meeting 4 January 2018. There are also Thames related articles on: Steampunk (page 92), Twentyman's Funeral Services (pages 94-95), and WW100 Forests (page 100). You can read the magazine online. 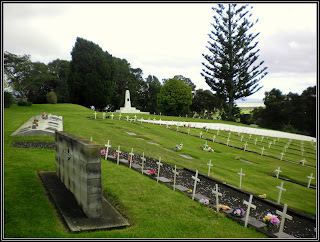 Did you know that thousands of 'new' World War Two names have been added to the Auckland War Memorial Museum Cenotaph? This is accessed online, and you can add photographs and details for any of the entries. The names for the majority of the Thames servicemen and women interred at Totara Memorial Cemetery, Thames have been entered at Findagrave, If you can help with photographs or further information, just sign up as a member (its free) and submit information. Sample below, showing the page for Doug at the Findagravesite. ABOVE RIGHT: View across the top of the RSA section to the WWI section in the distance. Reminder that I am always on the lookout for names for the Thames WWII Roll of Honour List. Another name and photograph just added to the list is for Walter Selwyn MCMAHON. 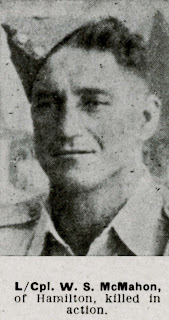 Lance Corporal McMahan was serving with the 21st Infantry Battalion during World War Two, he died in Italy 10 April 1945. He is remembered in the Faenza War Cemetery in Italy. Walter's parents were Mary and Manfred McMahon. 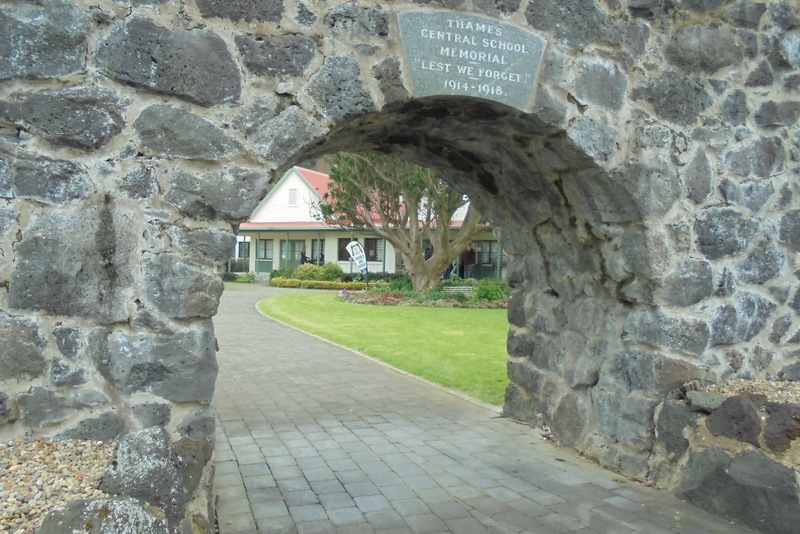 The McMahon families were well known at Tapu. Walter attended the Thames Central School during 1923-24, and in later years had been a Thames Valley Rugby representative. Walter married Madeline Estelle Flavell in 1938, and the couple lived in Hamilton. can you please email details. 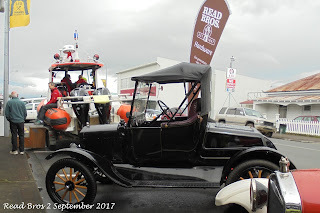 Thames (NZ): Thames in "The Growth of New Zealand Towns"
The Thames, our old goldmining town is currently commemorating 150 years since the proclamation and when the official hunt for gold began. The town is featured in a new book compiled by Hugh Dickey with contributions from researchers around New Zealand. Yes, Thames has even made the front cover! There are two pages specifically on Thames that I contributed, along with statistical data from the Author Hugh Dickey. Did you know we were ranked the fifth largest town for nearly decade? Overall the book is beautifully presented, colour throughout on high gloss paper. 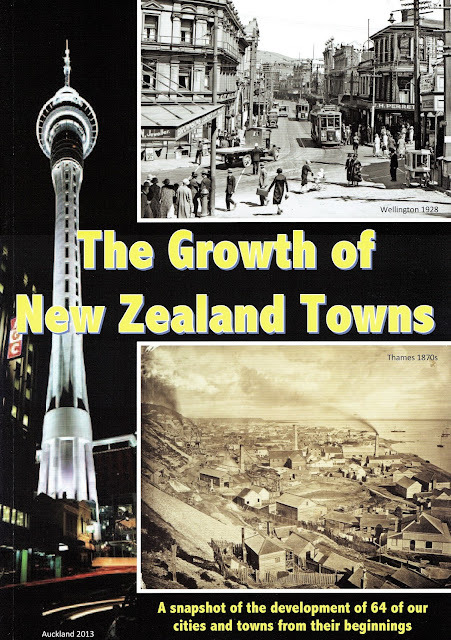 There are over 50 towns covered in-depth, along with a thorough analysis of the population growth of New Zealand. Contact the Author for further information and purchase direct - excellent value for money! For Thamesites, a copy is available to read at The Thames Library and The Treasury at Thames. Thames 1870s lower right - taken near Kuranui Bay. Looking south towards the Moanataiari, Tookey's Town, Grahamstown with Shortland in the distance. The headland of Totara can be seen on the horizon top left. 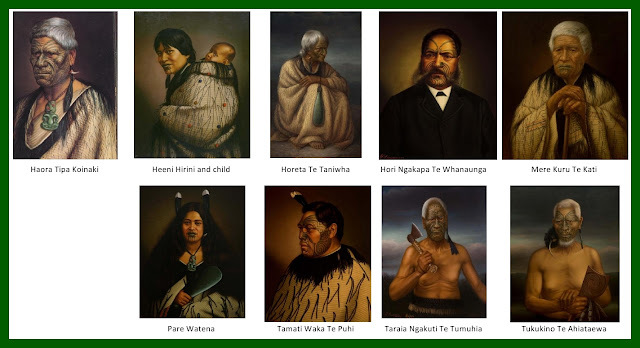 Thames (NZ): John Grigg's "My Own New Zealand Home"
John Grigg (1838-1920) was an extraordinary Thamesite, recognised around the world because of his astronomical studies and discoveries. In an obituary it was stated that Grigg was the only photographer in the world to capture a shot of the 1901 comet; and that the Astronomical Society of the Pacific had awarded him two medals over the years. He was also a fellow of the Royal Astronomical Society. John Grigg discovered three comets in total (1902, 1903, and 1907), which each were named after him. He built a special observatory at his Queen Street home, just south of the Pahau Street intersect. 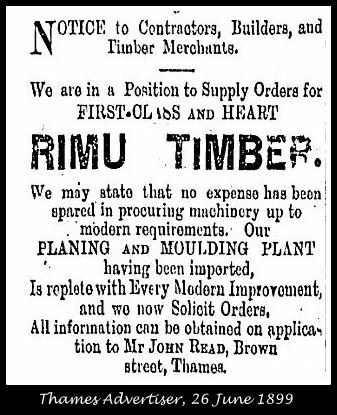 Grigg moved to Thames in 1868, initially he was in the upholstery and furnishing business, before moving into his specialty area when he established a music shop. He gave music lessons to private individuals and at several Thames schools. 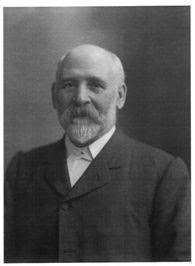 Grigg setup the Thames Choral Society in 1874, and composed many songs over the following years. One of the best known was "My Own New Zealand Home", a song that was said to be based on his beloved Thames. 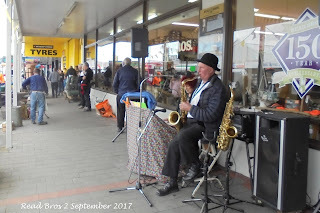 This song became known as the unofficial anthem of the northern part of New Zealand. 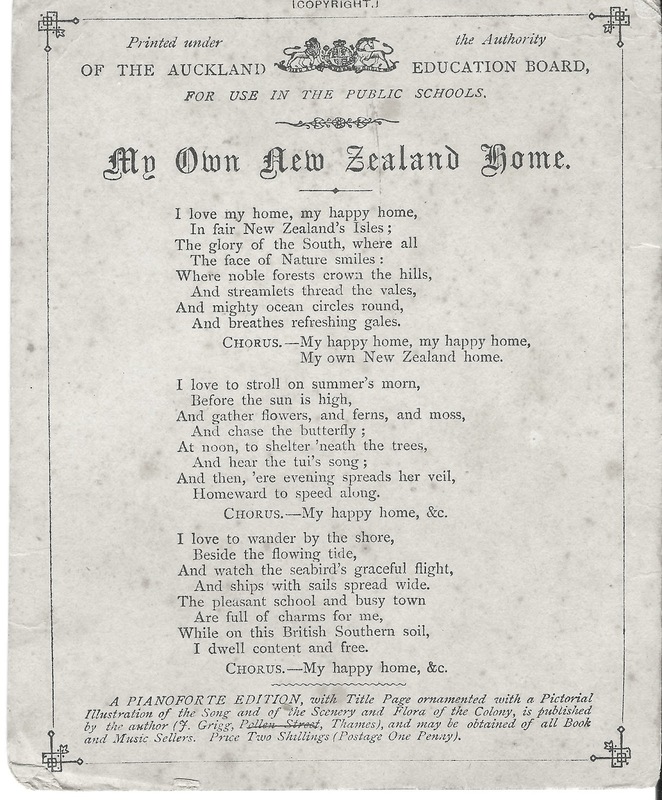 It was sung in schools and at official events not just in Thames, but the greater Waikato and Auckland area for many decades. 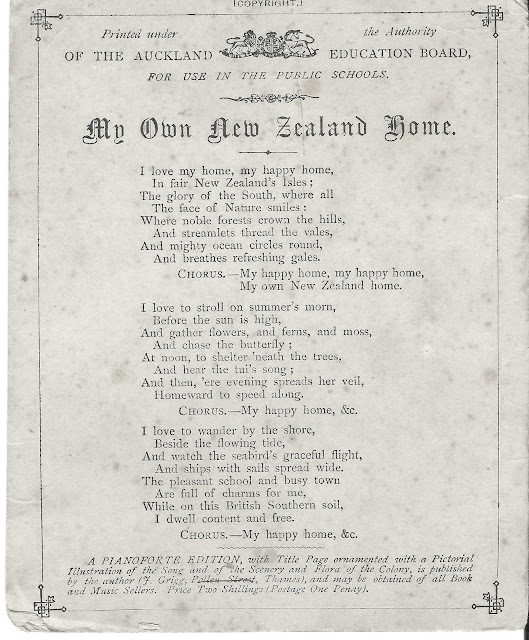 For instance at the opening of the Thames Branch Railway 19 December 1898, school children sang "My Own New Zealand Home." (words below) Nearly 2000 children sang the special song under the conductorship of Mr Grigg himself. Afterwards they piled into carriages and were given a train trip to Matatoke. The newspaper reported at this time that the song had been composed by Grigg for the turning of the sod that had taken place in 1878. While stressing the importance of the song in the northern region, it was well known through out New Zealand. 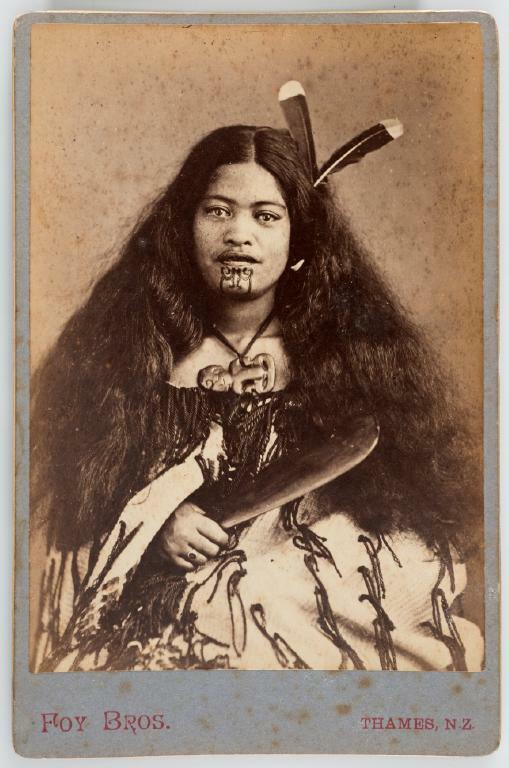 For instance in October 1888, it was sung at a concert in Lyttelton. An on an earlier occasion in January 1881, the St Stephen's Orphans Home in Parnell sang the song. 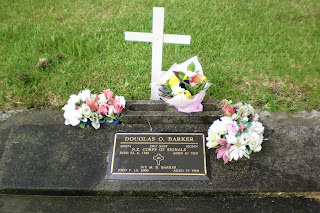 It is sad to say this great man, lies at Shortland Cemetery in a grave that has long seen better days. (photos below) Let us not forget this great Thamesite, who came close to having the title of having written New Zealand's Anthem. 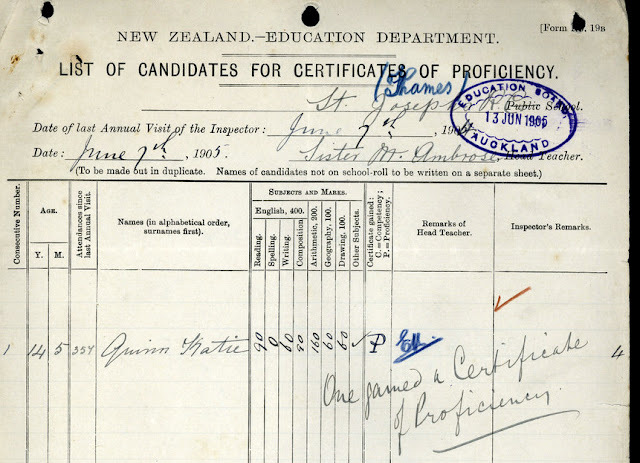 Have you checked the school records at Archives New Zealand recently? In the past few months they have digitised an ever increasing number of years. For instance there are records online for PARAWAI SCHOOL up to 1910. The class list for Standard Five and Six included: Winifred Claxton, Myrtle Garry, John Glessing, Hettie Hansen, Alma Menzies, Edna Morrison, Vera Pulford, Fredk Snowling, Joseph Waterhouse, Rita White, Eileen Young, Ruby Aro, Gladys Claxton, Fredk Daldy, Joseph Dickson, Eileen Garry, Flora Grant, Dot Gubb, Winifred Hudson, John Lockwood and Emma Lomas. 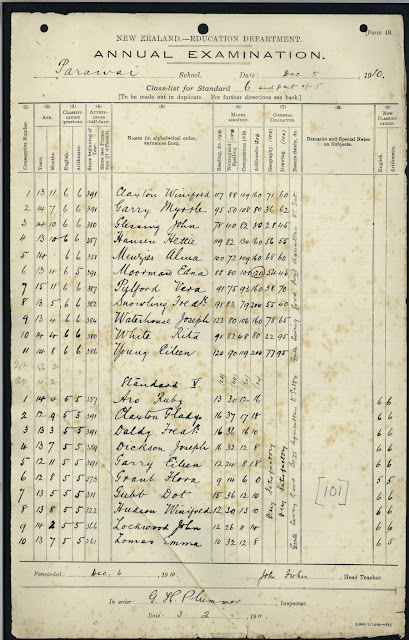 KAUAERANGA SCHOOL records are now available up to an including 1911. Try searching for some of the other Thames Schools at Archives. For general information on Thames Schools check out the summary list. So far there is just one page of records at archives for the St Joseph's Catholic School, but looks like there will be some more to come soon. This will be good news for many researchers, as catholic school records have been difficult to access in the past. 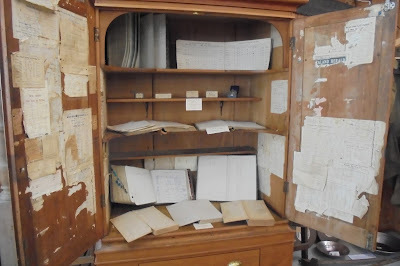 Catholic Archives do not have early school records but do have many other resources. Another way to find out more on schooling, is to search the end of year prizegivings published in the Thames Star Newspaper. PS. Don't forget the November 150th Church and School Commemorations. Social events were popular at the Thames from the time the goldfield opened in 1867. A wide variety of venues were used by groups, these included church and masonic halls, plus specialty rooms such as the Academy of Music. 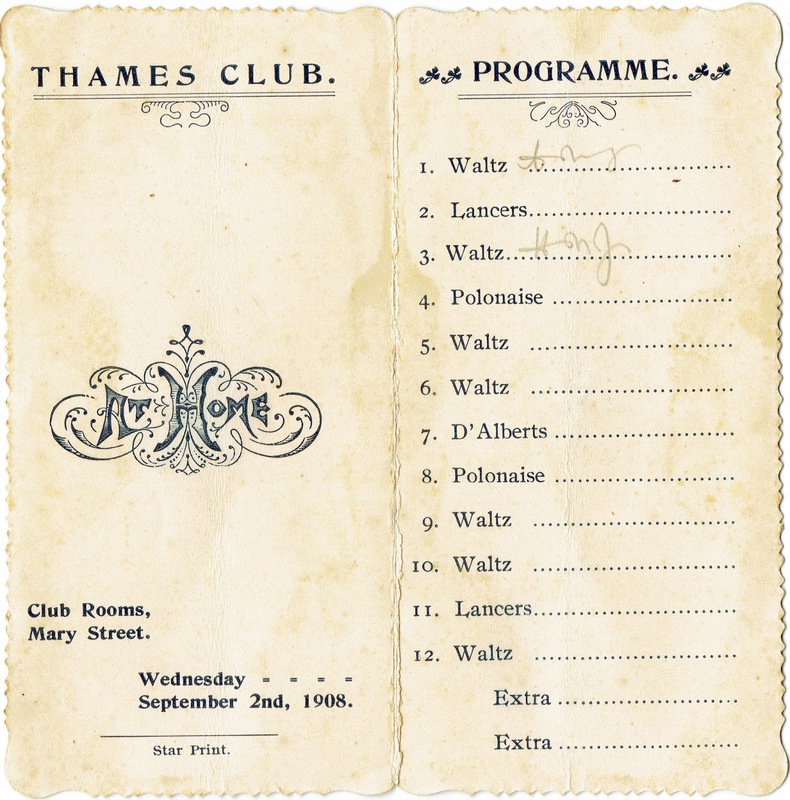 The Thames Club was another group that has operated for over 100 years. This is the story of a 1908 dance card that was recently obtained from an online auction site. BACKGROUND: The 'Thames Club' was formed following a public meeting 13 September 1904 - initially known as the Young Men's Club. In 1907 the group changed their name to 'The Thames Club' and purchased the old Lush property (then owned by Dr P Callan). In 2004 the Thames Club celebrated 100 years. The Thames Club is no longer located in the old club rooms, instead utilises space at the Thames Bowling Club. 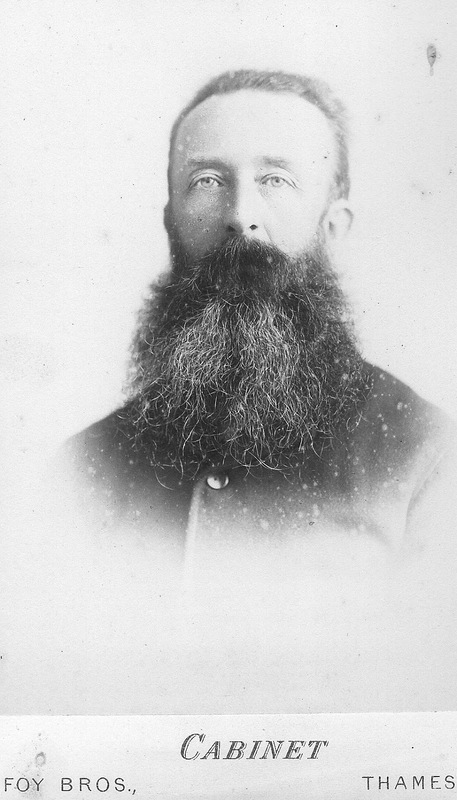 The President of the club was Mr William McCullough, the owner of the Thames Star Newspaper. 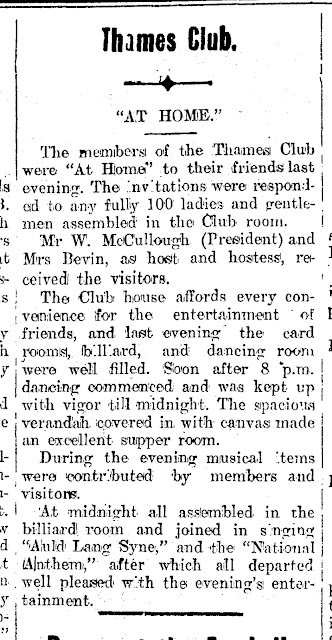 Over hundred men and women gathered that evening, the dancing started at 8 pm and went until midnight. 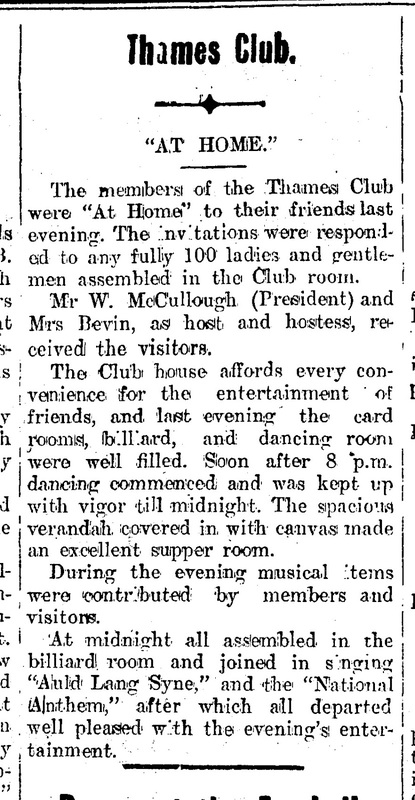 The dance programme was interspersed with musical items presented by club members. 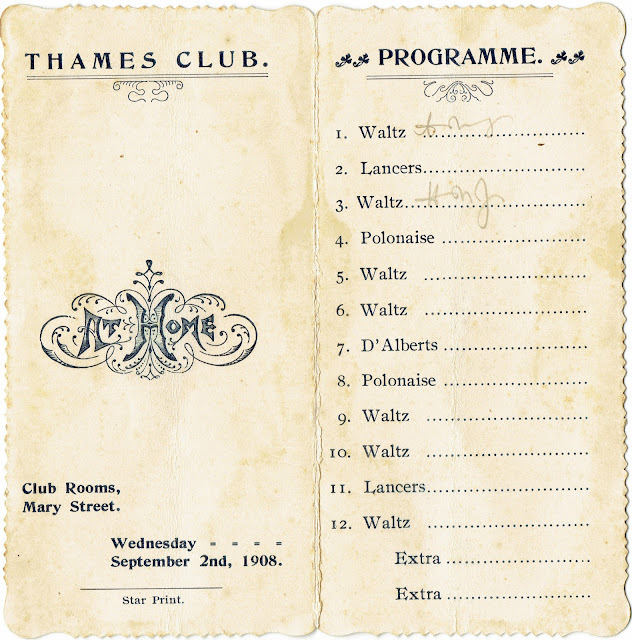 The 'dance card' was an important piece of paper, as those present would fill their card for the evening with partners for the programme of dances. (see below) The dances on the 2nd September included the following: Waltz, Lancers, Polonaise, and D'Alberts. The evening ended with the singing of Auld Lang Syne and the National Anthem. Thames Club 100 Years 1904 - 2004, E F Kingsbury & N I Mills. 2005 Thames Club. While the intersection of Albert and Brown Streets, Thames is commonly known as 'Scrip Corner', it is remorse not to remember the grand landmark that graced the north-eastern side of the roads. 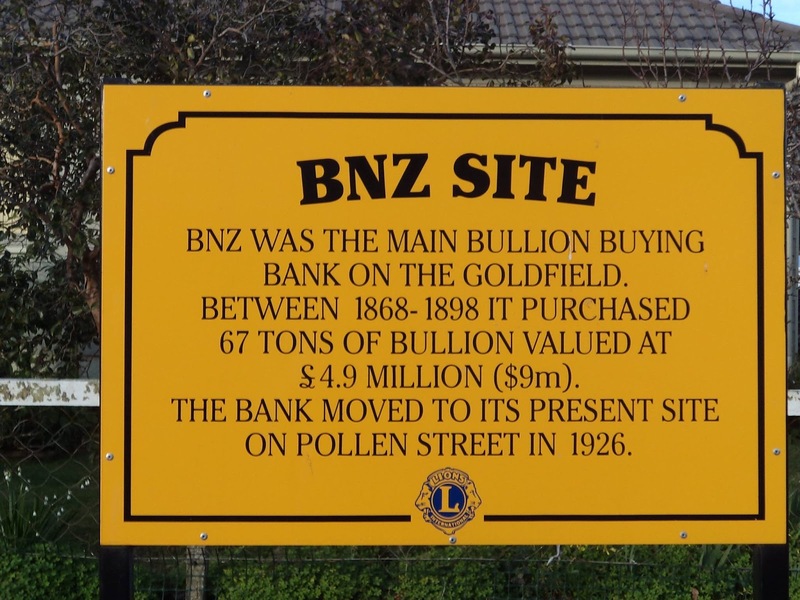 Many people often ask why was the grand Bank of New Zealand building destroyed? "Banks were soon established at The Thames when the goldfield opened. 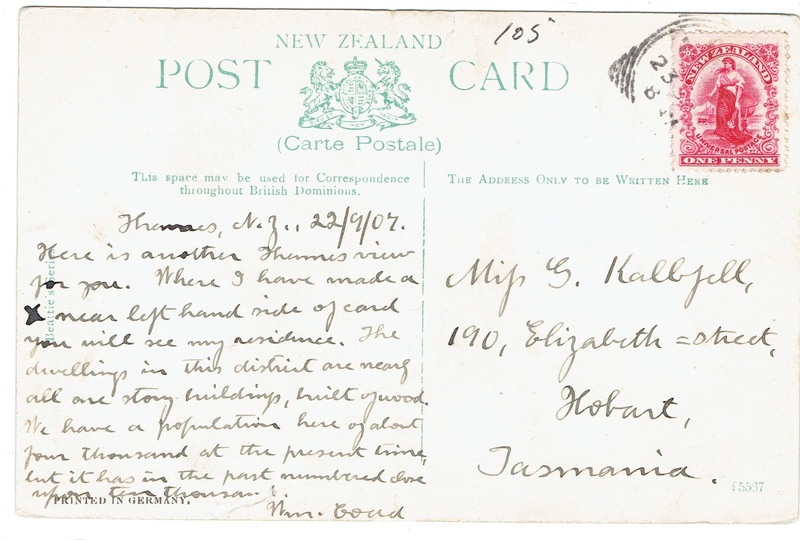 This included the Bank of Zealand (1868), Bank of New South Wales (1868), National Bank of New Zealand (1873), and Australia and New Zealand Bank Ltd (1877). The Bank of New Zealand first opened February 1868 in the town of Shortland, Thames. The Manager was Mr H F Christie and it was described as a three-room wooden building in Pollen Street. This Shortland agency was closed 1st April 1871. As more gold was discovered the area of Grahamstown became an important business area and the bank opened a branch there on 13th February 1869. Around April 1870 the Grahamstown branch moved into a grand new building on the corner of Brown and Albert Street. The bank had a gold office and assay room. As things declined economically in Thames, the Bank of New Zealand moved back to the Shortland area of Pollen Street, to the corner of Sealey and Pollen Street; where they still operate today. Early managers of the bank were: H F Christie (1868), T L Murray (1869-1893), W Burton (1893-94), and A Smith (1894-1907)." Then & Now: The photo below allows us to see the old bank once more, proudly standing where now a house and old hall are located. On the left the old Wharf (aka Park and Lady Bowen) Hotel. 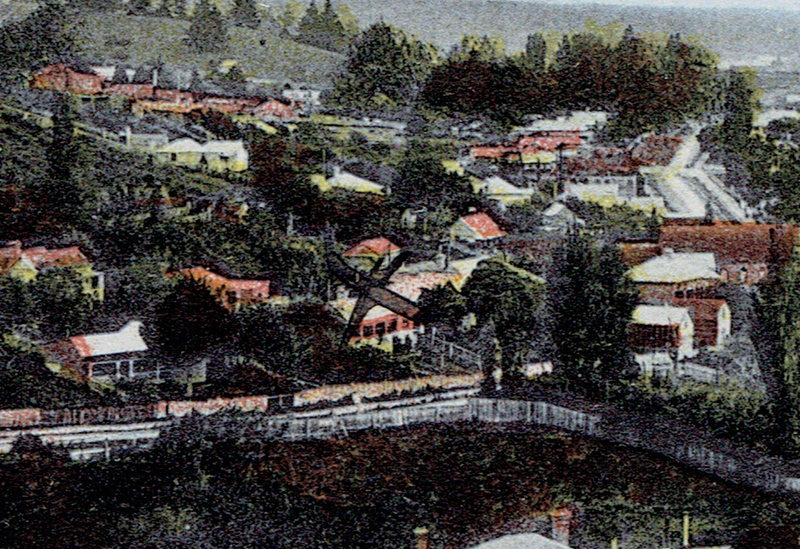 In the distance the old Royal Hotel and the old Lady Bowen Hotel on the centre right. The Bank building was demolished in the late 1920s, when it was no longer required. The construction in some ways just a two sided facade, and the material used was soft and by then in poor, crumbling condition. Congratulations to Tom Webb and Rosalie Steward for producing a wonderful video on the opening of the goldfield - which contains a considerable amount of background history. Take a few minutes to checkout the video, and subscribe to future ones in this history series. Find out and hear more, at the Thames Museum, Cochrane Street, Thames. 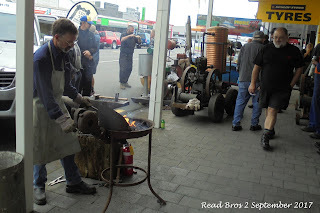 Read Bros has been at the Thames since just after the Goldfield opened. 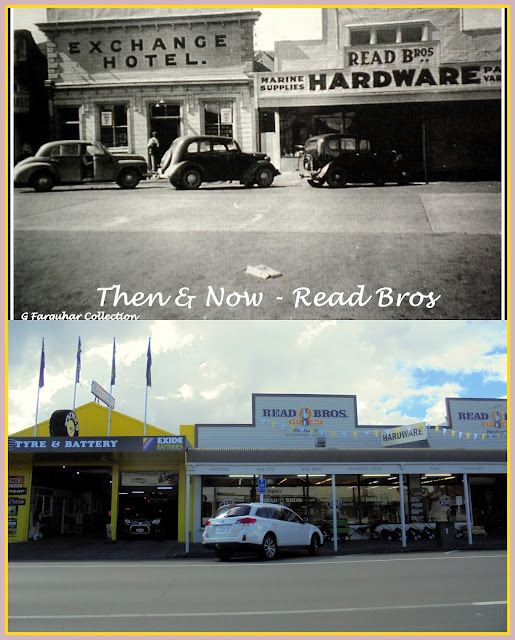 The name of the business as varied slightly, as five generations of Read's have run the family business. 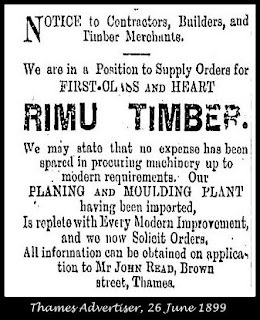 Started in 1867 by John Read in Brown Street (Grahamstown), he was a timber merchant and ironmonger. 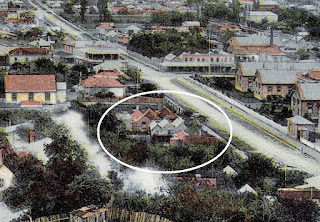 The timber yard was just south of the Pacific Hotel and Academy of Music that were located on the south-west corner of Albert and Brown Streets. Today this is part of Victoria Park South. The business expanded and Read opened a second yard at the south end of Pollen Street, Thames. Sons Charles and Arthur Read took over the businesses when their father died. After WWII Alan Read entered the family business, followed by his son Stuart Read in 1972. "In 2003 John, named after his great grandfather, became the 5th generation Read to enter the family business." ABOVE: View along Owen Street to Brown Street. Read's Timber Yard marked by the cross. 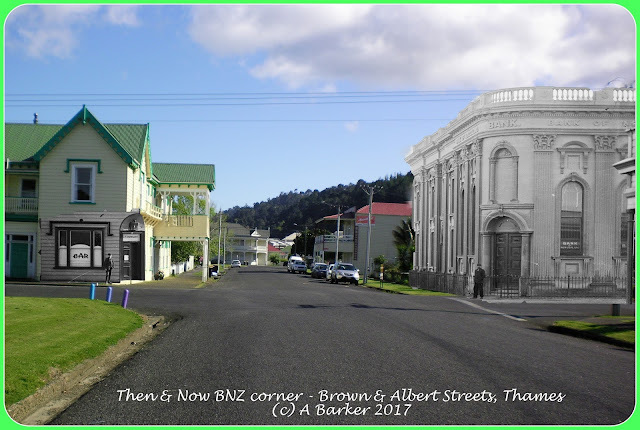 The 'Then & Now' view below is from the 1950s & 2017. The 1950s was view taken when the Exchange Hotel was situated to the north of Read Bros. Hardware Store in Pollen Street (between Richmond and Willoughby Streets). 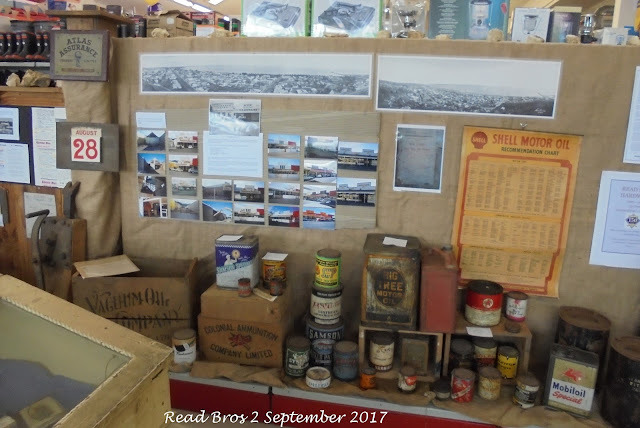 On 2nd September 2017, Read Bros is celebrating 150 years of trading with an open day. 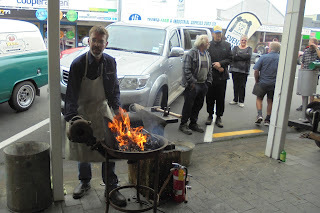 Activities planned include: gold panning, a vintage cars display, a blacksmith forge, a history display, plus instore prizes and giveaways. 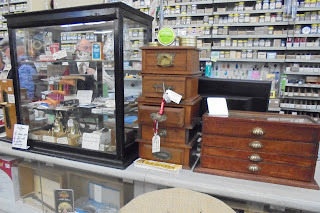 The store also has 150th memorabilia for sale for collectors.